Lawrie Alexander is an Englishman who moved to the States in 1968, after a 4-year stint in Singapore. His fascination with British cars started at an early age when, in 1955, his father bought a 1930 Triumph Super 7 which was always in need of work. This car soon replaced bicycles as an outlet for Lawries mechanical aptitude! The Triumph was followed by a 1932 Hillman Minx and a 1937 Vauxhall 14 on which brake and suspension work were learned, and first efforts made at engine overhauls  successful ones, his father was pleased to note. Once his Drivers License was obtained, Lawrie bought a 1939 Standard Eight Tourer which was fettled into good running order and given a repaint (by brush, no less!). This was replaced by two 1934 Morris Eight saloons which were combined to make one rust-free, mechanically sound car, then his first sports car  a 1934 MG PA 2-seater. This little car started the real love affair with British Sports Cars as, despite its rather dilapidated condition, it gave more fun per mile of driving than any other car he had driven at that time. Living in Wimbledon, Lawrie had several room-mates who also owned MGs. At one time, there were two PAs, a TC and an M in residence, with a TA and an NB as frequent visitors! Lawries PA was sold when he was about to be transferred overseas, replaced temporarily with a Wolseley 4/50, an MG Y saloon, and a 1937 Rover 14. The move to Singapore brought with it a company car  and the opportunity to begin participating in motor sports. Rallies, Sprints, Hill-climbs and Driving Tests honed his driving skills and kept his mechanical skills in use as the company car (a 1964 Triumph Herald 12/50) was massaged to become more competitive. A locally-built "special" (Turner body on a custom chassis with a 1955 2-litre Alfa Romeo engine and gearbox) also kept the finger nails greasy and the reflexes sharp; it was very quick and not especially forgiving! In 1968, the family moved to Chicago, Illinois then, in 1971 to Troy, Michigan. A 1963 MGB was purchased to fill the need for something British in the garage and it received a (not-really needed but just had to do it!) mechanical rebuild. The next move was to Santa Barbara, California in 1974, where a 1954 MG TF was purchased and completely restored. This major undertaking led to a meeting with Richard Wood, another Englishman, who owned a restoration business. From the job perspective, the move to California had not worked out so Lawrie bought Richards business and, for the first time in his life, began making a living doing what he best enjoyed: working on cars. Initially, the emphasis was on American Classics but, gradually, more and more British sportscars found their way to the shop. During this period, Lawrie also built and vintage-raced a very successful MG special (known as the KT as the body resembled a K-3 while being built mostly from T-series parts). Lawrie also owned a succession of MGs of all types, and an assortment of other sportscars. At one time, there were seventeen cars in the family! In 1980, a by then very successful business was sold to Moss Motors. Lawrie went back to wearing a suit, becoming a part of the Moss management team during a very vital and busy growth period. In 1987, working with the cars themselves became more appealing than the bustle of corporate life, so Lawrie reopened his own business restoring and repairing British cars. Another change came in 1991, when he lost his building lease and had to find new premises. Both the children were now grown, Santa Barbara was no longer the sleepy seaside town that had been so appealing in the Seventies, so a move to Northern California was made. Such was Lawrie’s reputation for quality restoration work, jobs followed him and it was not long before the plan to work from home fell by the wayside. A building was purchased, Steve Pratt taken on as a partner, and British Sportscar Center came into being in January 1994. Since then, business has gone from strength to strength. Steve left the business in 2000 to pursue other career choices, and now Lawrie has decided the time has come to scale the business back and concentrate on the cars he knows and loves the best: T-series and earlier MGs. Owning seventeen cars no longer has any real appeal, so Lawrie's sportscar stable is reduced (numerically, not qualitatively) to his 1968 MG BGT and another 1934 MG PA 2-seater. This latter car is presently undergoing a total restoration; when finished, it will mark the culmination of 40 years of experience and enjoyment of these great cars. It may well be the last restoration done for himself - unless a 2-seater MG NB should happen to come along, in need of a new home and some tender, loving care...! In addition to working on British Sportscars, Lawrie has long been active on the club scene. 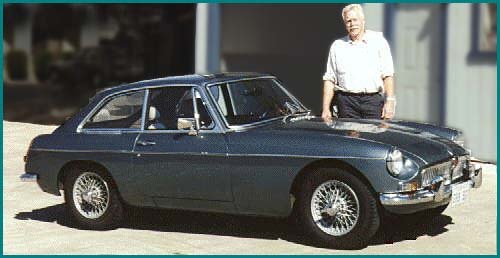 In 1975 he started the Santa Barbara Chapter of the California MG T Register (now known as the Special-Ts). After the move north, he joined - and is past president of - the Sacramento Valley MG Car Club. He has also organized numerous events, from local rallies to national meets, including the 1993 GoF West, NAMGBR's "MG '95" and NAMGAR's GT-24 in 1999.
custom interior and special paint job make this an eye-catcher that's really fun to drive!